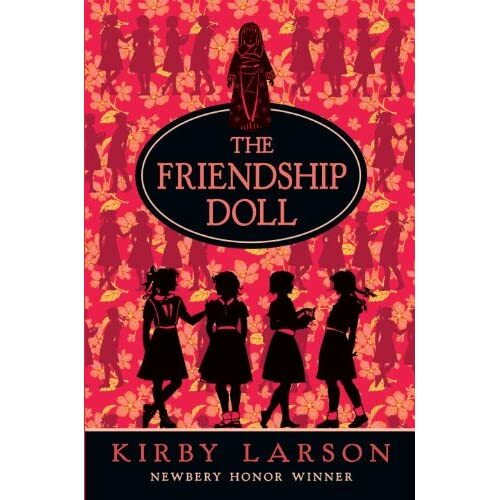 From the author of Hattie Big Sky, Kirby Larson weaves a brilliant tale about a beautifully created Japanese doll, Miss Kanagawa in the book The Friendship Doll. Crafted by Master dollmaker Tatsuhiko, Miss Kanagawa was commissioned to be an ambassador of friendship between Japan and the United States. This part of the story is actually based on fact. 58 dolls in all were sent from Japan in 1927 to tour the United States with a doll to be left in each city of the tour. Tatsuhiko put a little something extra in the design of his special doll, she is able to “speak” to the children offering them advice, guidance, and reassurance along the way. There are five special young people whose lives are greatly touched by the beautiful friendship doll. The story begins in 1927 with Miss Kanagawa arriving in New York City. Bunny wanted to be the one to give the welcoming speech at the reception but Belle Roosevelt was chosen instead. Planning to undermine and ruin Belle’s speech, Bunny arrives early where she encounters Miss Kanagawa. I won’t spoil what happens next. Lois is invited by her Great-Aunt to the Chicago’s Worlds Fair. Set in 1933 in the middle of the great depression, Lois’s best friend is Mabel who is getting skinnier by the day due to lack of food. Upon hearing that Lois is going to the fair, Mabel is equally excited for her friend. The night before going to the fair, Lois’s father, gives her a quarter to do something extra special with while at the fair. Lois’s greatest wish is to ride on the “Sky-Ride”. Taking a detour, she finds herself with her aunt at the doll exhibit where she meets Miss Kanagawa. What will Lois do with her quarter? The next story takes us to the hills of Kentucky, where Willie Mae lives in a holler with her family. though Willie Mae and her family are very poor, Willie Mae loves to read and waits excitedly for the librarian to bring her books. One day the librarian comes not only with books but with a paying job reading for an old wealthy woman named Mrs. Weldon. Mrs. Weldon is viewed as a self-centered eccentric but Willie Mae sees her differently and enjoys their reading time together, as well as, organizing Mrs. Weldon’s rock collection. This story especially grabbed out heart-strings as tragedy struck leaving Miss Kanagawa to give comfort to all. Lucy Turner loves to write letters and along with the letters she is writing to her best firend Gloria Jean, Lucy writes to Eleanor Roosevelt asking for assistance. As Lucy and her father make their way from Oklahoma to Klamath Oregon, Lucy always has hope that a secure furture is around the corner. Finally they enter a FSA camp in Oregon where Lucy goes to school. One saturday her class went to visit Dr. Evans new museum. There, she discovers the “Land of the Sun”, a room about Japan. As Lucy spies Miss Kanagawa, she is completely captivated with her beauty and all of her accessories. As WWII begins, anything Japanese was considered unpatriotic and Dr. Evans was forced to put the lovely doll away. Jumping to the present day, Mason doesn’t want to visit his grandmother Seal. Seal is suffering from Alzheimers but all Mason wants is the grandmother that he knows and loves. No longer recognizing Mason or his sister Emma, the children leave Seal in their mother’s care and head up to the attic for a little exploring. They come across Miss Kanagawa in her little trunk. They bring the doll down to Seal who becomes very animated upon seeing her once cherished treasure. Holding Miss Kanagawas, Seal shares moments from her past for the first time in months. What secrets does she disclose? We absolutely loved this book and couldn’t put it down. I think we read it out loud in two days. We read it everywhere we went. The historical details are well researched and woven seamlessly into the story. Kirby Larson is a creative storyteller who weaves the power of friendship into every page of this wonderful story. Recommended for read a-loud starting at age 5 or 6 and solo reading for age 9. Grab your copy on Amazon HERE. To bring the heart of this story home, we created our own version of an origami friendship doll. Often times origami can be very difficult to teach without sitting right next to the teacher. We worked on this pattern until we came up with a version that even the very smallest hands can do. Please click on the link below to download the tutorial. Enjoy! Thank you for sharing. This is delightful and a lovely story–along with a clever origami project. Thank you for stopping by, Katie! What a lovely pairing of the book and activity! I’m not familiar with the book — I’ll need to check it out! Thanks for sharing.